7th & 8th graders: Please see Mrs. Miller in the office during a study hall or at lunch to collect your money from prize day. Activity period today will be for Spanish Club. They will meet in Mrs. Richer’s room. All other students should report to homeroom. The last day to turn in an application for the STEM overnight field trip to Gibraltar Island on Lake Erie is TODAY. Don’t miss out on this awesome opportunity to learn about our Great Lakes ecosystem, collect samples on a research boat, work in the lab, and spend a night at OSU’s Stone Lab facilities. Application and deposit can be turned in to either Mrs. Miller or Mrs. Meller. 7th & 8th graders, please remember to pick up your fund raising orders in the atrium after school today. Driver education classes will be starting at Archbold High School on April 3. Information can be picked up in the high school office or you can call Craig Link at 419-266-9907. Prom RSVP’s must be turned in today. Return the tear-off portion from your ticket and any money to Lindsey Crossgove or place in Mrs. Miller’s mailbox. There is a $20 deposit fee per person and all underclassmen or non-Pettisville dates must pay $20 for a dinner. 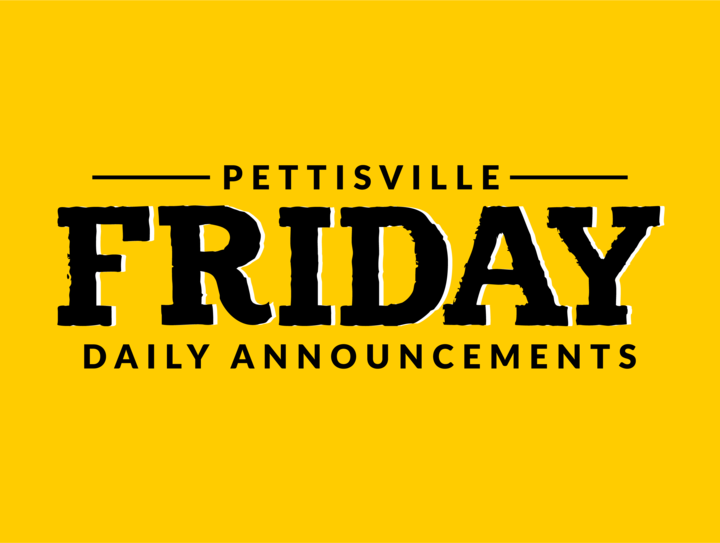 Yesterday, the Scholastic Art and Writing Awards released their list of national medalists, and we are proud to announce the Pettisville students who received a historic three national Scholastic awards. Junior Madeleine Wixom received a silver medal in photography, senior Gretchen Lee received a silver medal in writing, and eighth grader Lyla Heisting received a gold medal in writing. This is an incredible accomplishment for each of these individuals. If you see any of them today, please tell them congratulations. We will be holding a walk-out today in remembrance of the victims of school shootings and to raise awareness for gun violence. If you want to join us, leave your classroom at 10:00 and proceed to the JH gym where we will hold a moment of silence and discuss what we can do to make our school a safe place for all. Detention today will be in Mr. Horning’s room #150. The bus of OJSHS will leave at 4:00 today. Meet in the atrium after school. Make sure you have given Mrs. Meller your bus slip.